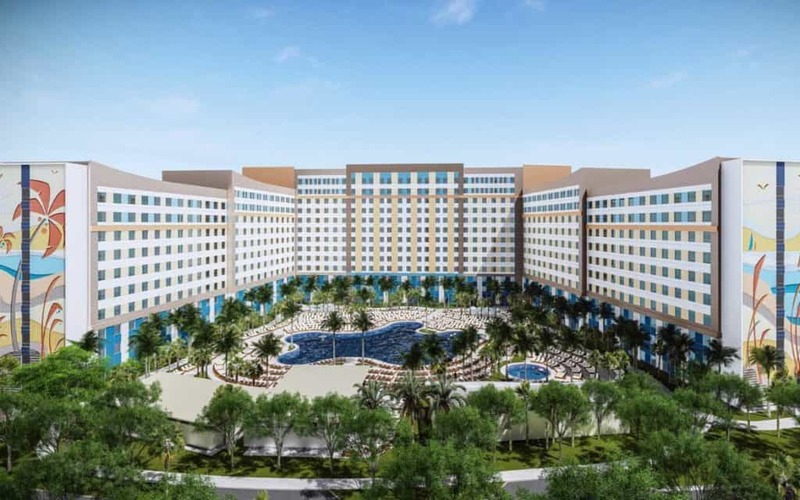 Now, today, Universal has taken us to the finish line (well, for this first stretch of purely metaphorical road, at least) and, at long last, revealed the hotel complex’s name: Universal’s Endless Summer Resort. 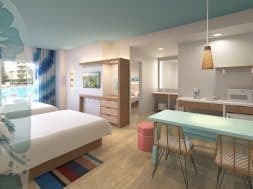 The overarching name reasserts the “laid-back coastal feel” that the company is going for with its new property, and while it might seem a bit out-of-place when compared to the likes of Cabana Bay Beach Resort, Sapphire Falls Resort, or Aventura Hotel, the three most recent on-site destinations to open (in 2014, 2016, and this upcoming August, respectively), it also generally complements their sense of sun-filled fun. It’s also easy to imagine the hotel’s associated marketing campaign – “Have endless fun at Universal’s Endless Summer!” Given that it’s not located on the same chunk of land as CityWalk and the three parks, such an advertisement push might be needed – and may have very well factored into the name-selection process. 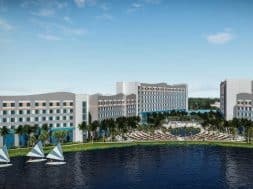 Endless Summer will comprise a fourth on-site hotel category for Universal: value, which isn’t to be confused with Cabana Bay and Aventura’s prime value appellation. Prices at both Surfside and Dockside will start at the low, low price of $73 per night, which is almost exactly half of Cabana’s lowest rate of the year – not too shabby. And more than half of the two venues’ rooms will be two-bedroom suites, which will sleep six and will include a kitchenette, dining area, and a two-compartment bathroom (shower and vanity); the starting price here is $111. 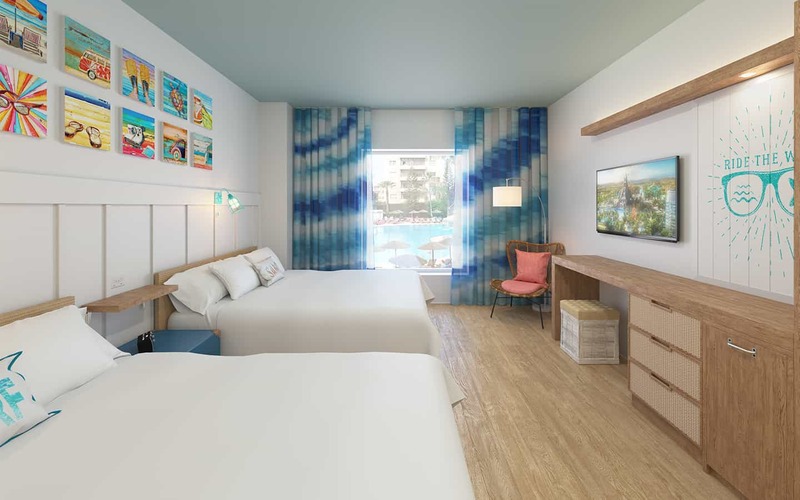 Although part of the company’s more general (and more recent) push to expand the types of hotel rooms it has on hand at Universal Orlando – in this case, offering sub-$100-a-night rates and even more two-bedroom family suites – this new venue also represents the start of a whole new strategy for Universal: the expansion from its original, approximately-725 acres of land to new swaths of real estate located a bit down the road, making the resort a geographically-displaced one. 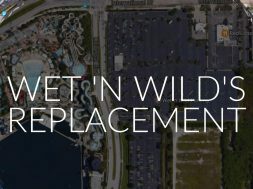 Although one could argue this has been the case since 1998, when Universal first purchased Wet ‘n Wild, this new resort complex that will replace it next year will be far more integrated into the Universal Orlando branding, marketing, and, even, operations, with far more shuttles scurrying back and forth from the venues to CityWalk and the two theme parks. What’s more, there’s an additional 575 acres located a further five minutes down the road that are ripe for development, whether that new construction ultimately results in even more hotels or additional parks; by this time next decade, what we call Universal Orlando Resort will have nearly doubled in size and will require “island (of Adventure) hopping,” jumping from one themed parcel of land to the next to continue one’s vacation. In the meantime, we’ll simply have to contend ourselves with hopping to this first additional 64-acre property, even if it’s in bite-sized chunks. 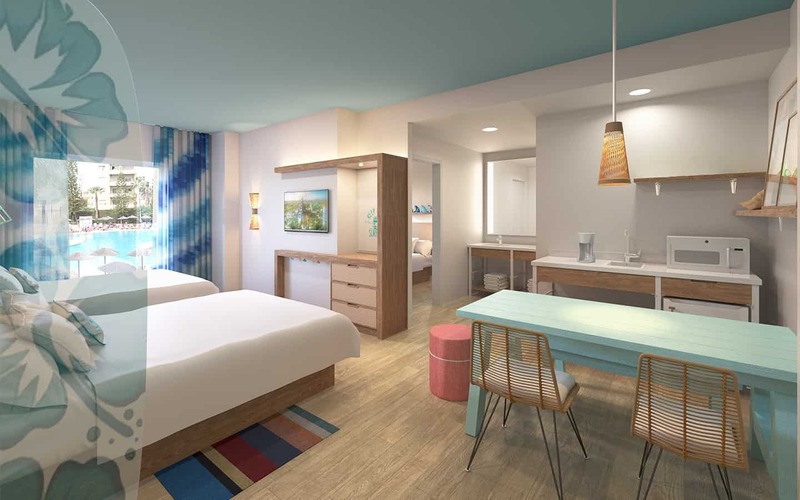 Universal’s Endless Summer Resort – Surfside Inn and Suites will open in summer 2019, with Dockside Inn and Suites following sometime in 2020. You can get a nice, comprehensive overview of all of Universal’s on-site hotels here, in our complete guide.